Christian Cameron on how experimental archaeology and reenactment influence his writing. I was recently in a panel that discussed the limits of authenticity in historical fiction. A wide variety of views were put forth, including some that might surprise; one author suggesting that it was impossible for any modern writer to accurately understand, much less represent, the reality of the past – any past. While this point of view may at first glance appear radical, I think it’s worth considering. I will confess that I have always had qualms about the limitations imposed by genre, in writing historical fiction, especially with a military bent; and as an historian, I have always had reservations about everything from paucity of evidence to cultural bias. Issues from the past, especially those that are still very much with us today, can be so contentious as to blind us to stark historical realities; sexuality, the roles of women, ideas of nationalism and even of gender that, when examined carefully, do not always bear out as having any impact on the past. To try a non-contentious example (at least to an English audience) the story of the Greek independence movement in the late eighteenth and early nineteenth century is one that would be very difficult to explain without using ideas like ‘Greek’ that may not really have existed in the period. So, yes, it is very difficult to grapple with the mind of the past; especially as there is not one mind, but millions of minds, each as different as one modern mind from another. But there are tools; and it is in those tools, it seems to me, that the quality of our recreation of the past will lie. First, history is not the only lens through which to bring the past into focus. I’d assert that the history of philosophy (I happen to be a passionate dabbler in philosophy) and literature both offer us authentic windows into the deepest thoughts of the past. If Herodotus seems to offer a confusing and culturally biased account of the Persian Wars, the addition of Aeschylus and Pythagoras might help us be a little more comfortable. Surely Socrates (granted, as represented in Plato) as a hero of the Athenian war effort in the Peloponnesian Wars, as well as an intellectual of enormous standing, or the comedies of Aristophanes, give us different lenses to examine Ancient Greece, even if the subject remains the Peloponnesian War. But it is to the complicated world of experimental archaeology, and its cousin, reenacting, that I will turn. Experimental archaeology, at its purest, would contend that if we assemble the right material artefacts and we use them correctly, we should be able to learn something about the past. This might take the form of building an Iron Age round house or using a particular kind of sword or shield; it involves a spectrum of validity from the very casual to the ultimately scientific. If the philosopher Edmund Husserl’s assertion that the only way to understand history would be to ‘experience’ it directly is true, then reenacting, and it’s scientific cousin, experimental archaeology, are the best ways to reach that understanding. We haven’t even had a fight scene yet, and we don’t know anything. And that same cloud of unknowing can surround even the smallest detail that can define domestic life. How, for example, did a Spartan light a fire? There is not a single mention of flint and steel in the whole corpus of Greek literature; it would appear that Spartan armies carried fire pots with smoldering coals from camp to camp on the march. 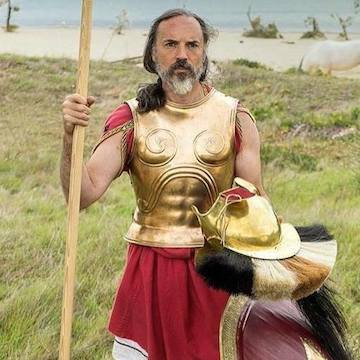 But as a writer of historical fiction, whatever small contribution my reenacting and experimental archaeology may make to, say, understanding the Battle of Plataea, the contribution of the recreation of the past to my own experience is far greater. To some, very limited extent, I have experienced some small bit of the life of a hoplite. With luck, and practice, I can then translate that to my readers, and that experience, that recreation – for isn’t a work of historical fiction an attempt to take the reader into an experience of the past – is what gives some authenticity to the exploration. And some hope to the author that it is possible to understand the ‘other country’ of what men and women did, whether in 480 BCE or 1367 Italy or wherever we encounter historical fiction. Christian Cameron is the author of the Tyrant series and the Long War series. He lives in Toronto, Canada and is a dedicated reenactor. 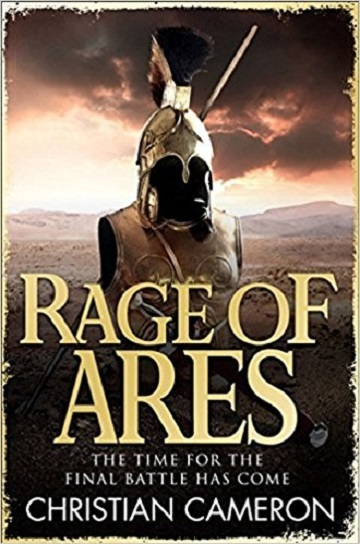 His latest book, Rage of Ares, concludes the Long War series and is out now in paperback.